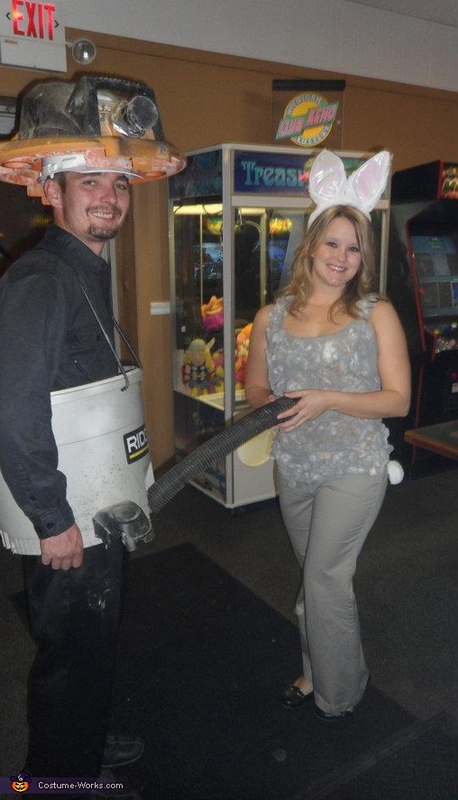 This is my boyfriend and I dressed as a shop vac and dust bunny. His shop vac broke, and while he was trying to fix it he came up with the idea to wear it as a costume. He used the cord as straps to hold up the tank. He cut the motor out of its housing and screwed a hard hat into it. He wore this on his head. He cut the hose short enough that nobody would trip on it and re-attatched it. Then he wore it all! I dressed as a dust bunny to go along with it. I just spray painted cotton balls gray and added some baking cocoa powder for a dusty effect. I glued the cotton to a gray tank top. I wore this with gray pants, bunny ears, and a fluffy white tail. I think this is the most original Halloween costume I have ever seen. Even searing on the internet I cannot find anything like it!